Everton Football Club's community ethos has provided inspiration to children in Kyiv during the team’s visit to the Ukrainian capital for tonight’s UEFA Europa League game against Dynamo Kyiv. Earlier today, Everton ambassadors Graeme Sharp and Ian Snodin were joined by staff from the Club’s official charity, Everton in the Community, to deliver a series of special coaching sessions for over 70 children at School #309 in the Poznyaky district of Kyiv. Local children also met Everton manager Roberto Martinez at the team's training session on the eve of the game in the Olympic Stadium. The plight of the Ukrainian children at School #309 was brought to the attention of Club officials by global charity, UNICEF, which has been working up and down the country to provide children with safe and nurturing environments and opportunities. “It has been a real privilege to work with staff from Everton in the Community to deliver these coaching sessions today and put a smile on the faces of these fantastic children,” said Sharp, an integral part of the successful European Cup Winners' Cup team in 1985. "Community is central to Everton's identity and heritage, and meeting these children while we have been in Kyiv has been an inspiring and uplifting part of our visit. 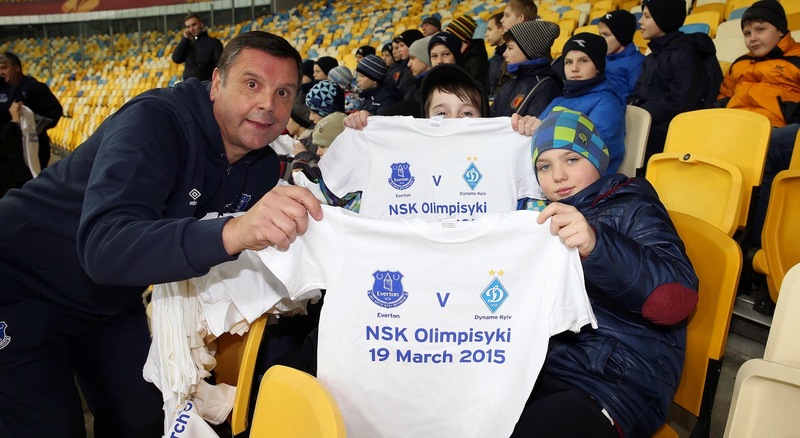 During the Club’s stay in Kyiv, Everton will also host children from Chernobyl, who have been invited to watch tonight’s UEFA Europa League last 16 second leg clash against Dynamo Kyiv. A long-standing relationship between Everton and survivors from Chernobyl - forged through various charities, including Friends of Chernobyl Children, Children of Chernobyl Life Line and Chernobyl Medicine - has facilitated annual visits to Liverpool since 2003 for children from the region immediately affected by the nuclear power plant disaster of 1986. A group of 18 Chernobyl children and four adults will be special guests of the Club at Thursday's game and will be greeted by the Everton manager on arrival. Everton and Everton in the Community have worked closely with UNICEF and the charity Children of Chernobyl Life Line to facilitate the events planned during the Club’s visit to Kyiv.